I don’t know about you but I’ve been seeing more and more creatives taking the leap into the world of knit and crochet design. They’ve learned all they can about creating great products and patterns, but often get stuck when it comes to figuring out just how to sell patterns for knit and crochet designs. So often I hear from new designers lamenting the fact that their new pattern is getting no traction. They’ve put in all the work to create a something unique and special…but no one knows it’s out there! Well, have I got a treat for you today! Stick around as I share a great new resource (that I was so excited to get a sneak peek of from designer, author, and college professor, Marie Segares of Underground Crafter. If you’ve been struggling to market your new designs, Marie’s new e-book, Design It, Promote It, Sell It, is just the tool you need to turn that around. Design It, Promote It, Sell It is Marie’s newest book for fiber artists and it is jam-packed with tips for getting your designs seen by the people who will LOVE them. And don’t worry if you’re a marketing newbie – Marie has you covered there, too. You don’t need to be an expert. She walks you through the entire process with her crash course in marketing (and it’s not scary at all). Marie’s e-book is a designer’s dream – she includes the marketing crash course, dozens of ideas to promote your designs online, tools for analyzing what is working and what isn’t AND a bonus section chock-full of checklists and other resources to help in your fiber-based business. Read a little hello from Marie and find her step-by-step guide to using the e-book and getting the most out of your investment. I love that she recommends reading the whole book through before making any decisions about what would be best for your business. This is just so wise…and it will help you to create a real strategy for your promotions rather than having you run around doing all-the-things. This chapter steps you through a 5-part marketing situation analysis and includes an accompanying resource to undertake an analysis of your own business. Then, you’ll learn about really targeting your customer, nailing your brand and the “4 Ps” of the perfect marketing mix. This, here, is the meat of the book (really, if the book were a plate, it’s all meat…but this would be the filet mignon). I mean, let’s be serious, you’re tempted to justs skip the first two chapters and dive into this one…but don’t, OK? The crash course chapter is such a great foundation for the rest of the work you’ll be doing. I don’t want you to skip it. In this chapter, Marie shares OVER a dozen different platforms/places for you to share and promote your patterns and breaks each of those down into even more detail. I have to admit that there a few tidbits that were new to me and I’ve begun testing to see if they’ll be a good fit for me and my customers. Here, you’ll find helpful ideas for sharing content online. The ideas shared in this section of Design It, Promote It, Sell It can be used for blog posts social media posts, or newsletter content. This chapter is all about gathering data in order to determine how well your marketing activities are performing. Often overlooked by creatives, analyzing the performance of your business will help you separate yourself from the not-so-serious crowd. And once you get a handle on this skill, you can use it to make the best decisions on activities that will continue moving your business forward. This is the section that will help you take action on all the things you’ve learned in the book. 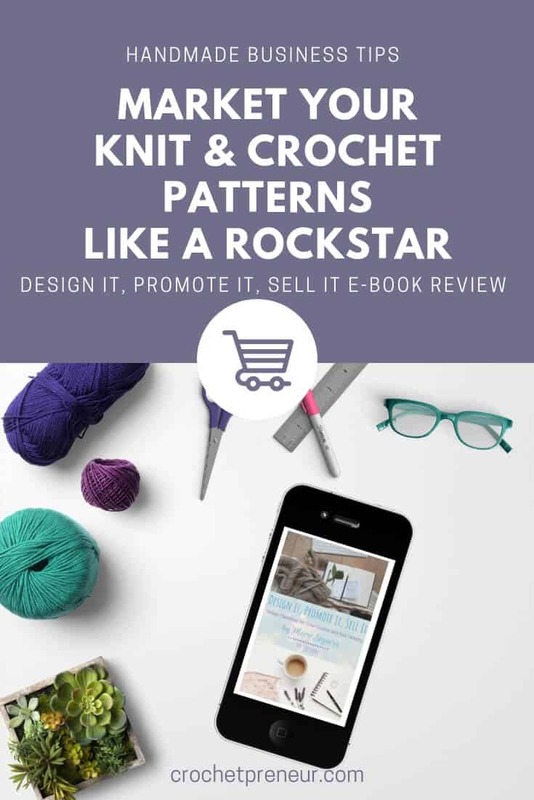 What an incredible resource for both new and experienced designers to learn how to sell patterns for their knit and crochet designs. If you’ve been struggling to master marketing or are looking for new ideas to bolster your current marketing plan, I highly recommend that you add Design It, Promote It, Sell It to your maker’s bookshelf. Thanks to Marie, I’m able to make that possible for one lucky designer! Simply enter the giveaway, below for your chance to win a copy of Design It, Promote It, Sell It. This giveaway for one PDF copy of Design It, Promote It, Sell It is open worldwide but void where prohibited. To enter, use the form below by October 31, 2018 at midnight US Eastern time. Please enter on a desktop computer if you’re having trouble on a mobile device. If you are on mobile and have difficulty entering, please use a desktop computer to enter. Only the email option is mandatory – all other tasks are optional, for bonus entries only. Good luck to you! A special thank you to Marie Segares of Underground Crafter for sponsoring this giveaway.